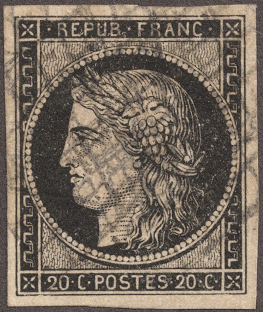 Printed by Tacquin at the Paris Mint. Scott #4 was prepared but not issued. There is no Scott #5. Of the 20 centimes black, Scott #3, 31 million were sold to the public. 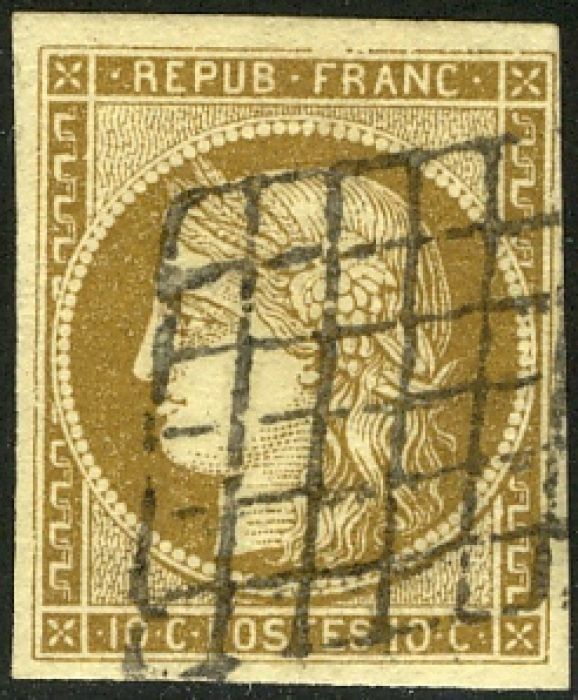 The 10 centimes stamp was used to free letters inside a commune, the 40 centimes freed letters bound for foreign countries. The 1 franc vermilion was replaced in less than a year because the color was deemed too close to that of the 40 centimes. The Gibbons numbering is rather awkward: whereas Scott takes the 10 centime denomination and lists the paper variants as sub- categories (1 bister, 1a dark bister, 1b greenish bister etc. ), Gibbons numbers them separately (SG2 greenish, SG3 brownish). You might want to stop by Les émissions de timbres classiques for much more information. Images from David Olson and Big Blue.